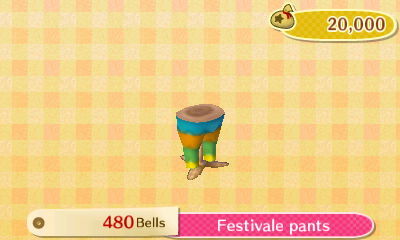 Festivale is Animal Crossing's carnival to celebrate and welcome the coming of spring. On this day you will find confetti falling from the sky and impressive catchy background music to boot. 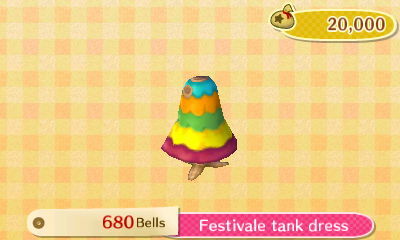 Your villagers will also be in the carnival spirit as they sing the town tune and wear a Festivale accessory and tank. The event runs the entire day from 6am until 5:59am the next morning. Of course, a carnival needs someone to lead the hip swaying and dancing to the rhythm of the music. 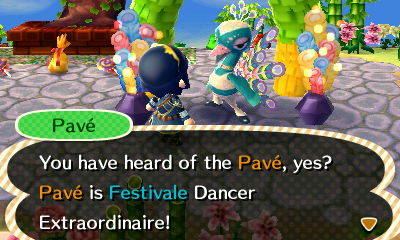 It wouldn't be Festivale without Pavé, the flamboyant dancing peacock who returns after his introduction in the Wii installment of the Animal Crossing series, more commonly known as City Folk or Let's Go To The City. Festivale is always 48 days before Bunny Day. Since both are determined by the Lunar Calendar, the exact date varies yearly. 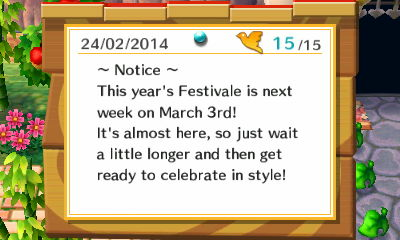 However, Festivale is always held between February 2nd and March 8th. 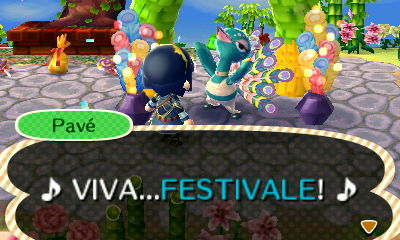 The following is a list of all Festivale dates for all of the years that New Leaf is designed to be played. Not only Pavé is there to head the celebrations, he also has gifts for you. 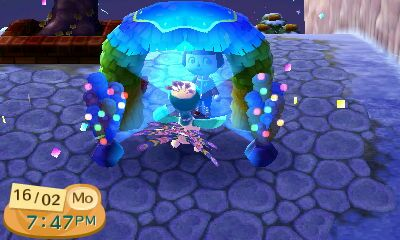 Go find him in the town plaza underneath the colorful arch and speak to him. In between shaking his tail to the carnival music he will request feathers. 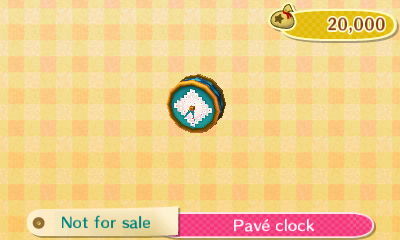 You can find them occasionally floating in the air throughout your town and the beach, camouflaged by the confetti. To catch one, use your net. A basic net is available from the Nooklings' store, from repeatedly talking to Isabelle when you first create a character, and from Nat at a Bug-Off tournament. 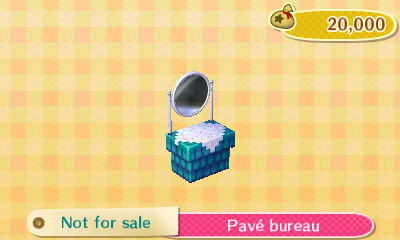 Pavé will ask you to collect three feathers of a specific color. The color requested is random but will be one of the following: green, blue, yellow, red, purple, white, or pink. 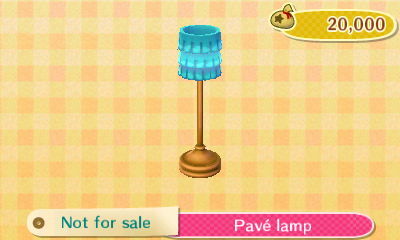 In return for fulfilling the request, Pavé will present you with a special gift that can't be reordered from the Nooklings' kiosk. In order to continue receiving gifts, keep speaking to Pavé to receive instructions on the next color of feathers he wishes for you to collect. The color of feather requested by Pavé is reset each time you start your game. That means that if he asks for a particular color of feather and you are having trouble attaining that color, you can save and quit in the hope that he'll ask for another color. 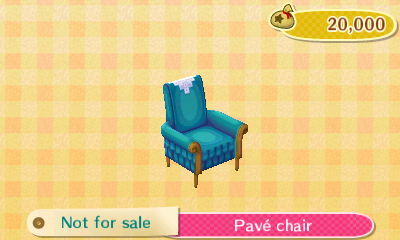 The random nature of his request means that, unfortunately, Pavé may request that same color again. 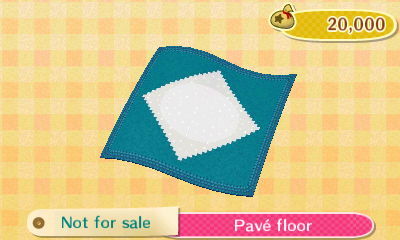 You should catch and keep all feathers that you see and it is helpful to keep them on the plaza ground if your pockets are too full. Keeping all the feathers is prudent as you never know which color Pavé will request. 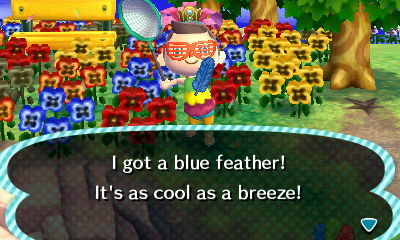 On rare occasions, you may come across a rainbow feather. 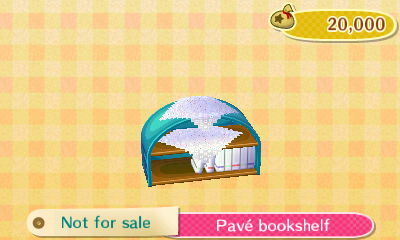 This is a valuable find because Pavé requires three of the other colors of feathers before he will award you with a gift, but he will readily part with a gift if he spies a single rainbow feather in your pocket. Anytime you catch a rainbow feather you can approach Pavé and he will accept a rainbow feather irrespective of the color feather he's currently asking for. However, after giving you a gift for the rainbow feather his original requested color still stands and you will need to find either another rainbow feather or three of the color he's asking for in order to acquire the next gift. 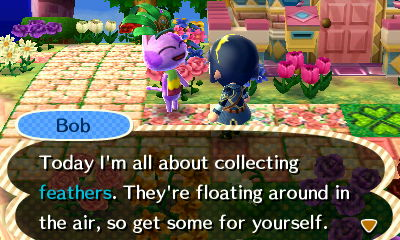 Regular feathers can also be obtained from your villagers. 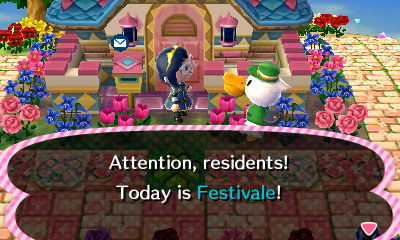 Festivale doesn't impact their sleeping times, so if you wish to interact with the villagers be sure to take this into account. 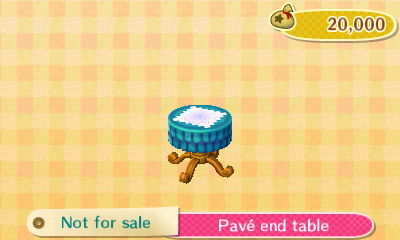 Sometimes villagers will ask for a simple trade: one of your feathers for one of their feathers. They'll specify which ones they want to trade and you can decline if it doesn't suit you. 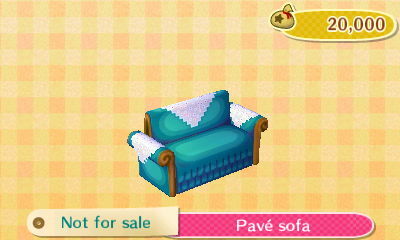 They often wish to trade for a feather of Pavé's current color, so make sure you have none of those in your pockets. Other times they will ask to play a game. Winning will result in a random feather whereas losing will result in the loss of a feather in your pockets. This will never be a rainbow feather though. If you don't have feathers in your pockets or if you only have a rainbow feather, they won't trade or play a game with you. You won't know beforehand whether a villager will trade or play a game, so ensure you're not standing straight in front of them when you engage them in a conversation, because they might want to play Charades, and for that you need to be able to have a clear view of them. Read on to find out more about the three games that villagers will play with you. You will get three options: rock, scissors and paper. Rock beats scissors, scissors beats paper and paper beats rock. Simply pick one of the three choices at random in order to win (or lose!) a feather. The villagers each have their own favorite choice, and once you've found out which one this is, you can always win. Hah! The villager will show a variety of emotions in order to explain a certain thing or situation. Simply pick the most appropriate answer according to their actions in order to win the game and a feather. 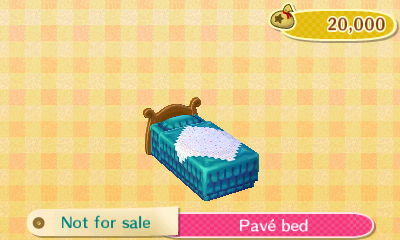 This game can only be played when the villager is inside their house. The villager will say "Made Ya" and you have to push on a direction on the d-pad in the way you think they will look. You get three tries. The next time they play this game with you, they often repeat what they did in the previous game, so making notes will give you an advantage. However, they don't stick to the same choices all the time like in the Rock-paper-scissors game. Giving Pavé 3 of his desired colored feathers, or a rainbow feather, will reward you with one of the following pieces from the Pavé Series. 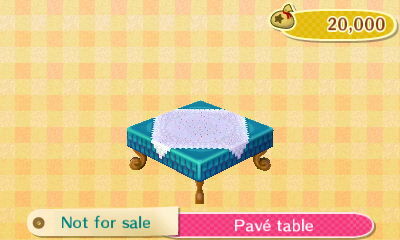 The flooring and wallpaper sell for 1,800 Bells and the furniture items sell for 12,000 Bells. The bad news is that Pavé will hand out presents at random. This means you'll get a lot of duplicates before having collected the entire series. It's up to you to decide whether you're going to endure it with a brave smile and keep on collecting feathers, or if you're going to quit without saving after having received yet another duplicate of an item. On the plus side, all those duplicates can be sold for a good price, and you can also save them up for a day that furniture is sold for double at ReTail. Besides giving them to Pavé, feathers can also be used like any other hat or accessory. You can wear them in your hair, display them, store them in letters, sell them, throw them away, or even give them to your friends. Displayed inside, they are presented on a wooden dummy head, like all hats. Displayed outside, all colors of feathers look the same: like a bunch of blue, green and red feathers. They count as litter and will ruin the perfect status of your town when you have too many on the ground. If you have too many feathers left over after Festivale you can sell them at ReTail for the following prices. You aren't required to wear Festivale attire, but wearing it may add to the festive mood. Clothing pieces are available inside the Able Sisters' shop and are found in-store starting a week before Festivale and on the day itself. All of the clothing pieces are sold separately leading up to the event, whereas on the day all of the clothing pieces will be available for purchase. The pieces and their prices are listed below. 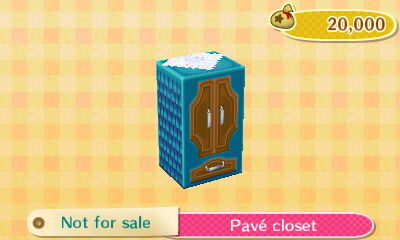 All of the clothing pieces are found inside the Able Sisters' shop whereas the accessory is found in Labelle's accessory department. 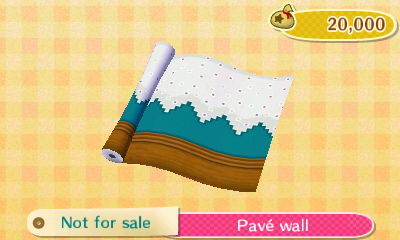 Each piece can be re-ordered from the catalog by accessing the catalog machine inside the Nooklings' store. 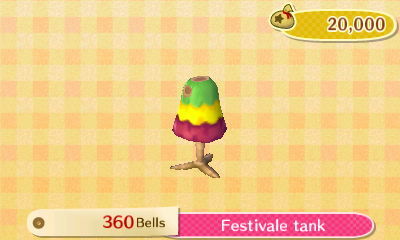 The villagers will be wearing the Festivale accessory and tank. Note that their accessories are in different colors compared to the one that's available in the shop. 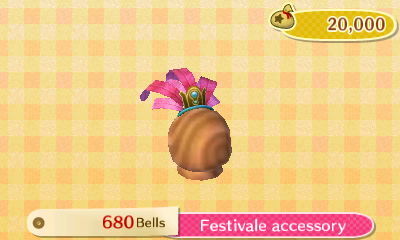 Sadly, there's no way you can acquire these differently colored Festivale accessories. You can play Festivale together with your friends! It's a lot more fun going after the feathers if you bump into your friends and watch them fumbling with their nets. 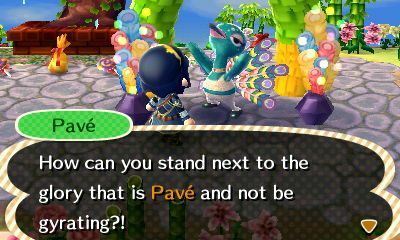 Pavé asks everybody for the same color feathers. 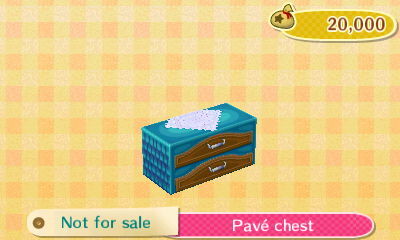 This means that if your friend has handed in three feathers of Pavé's choice and Pavé requests a new color, the color will also have changed for you despite you having had no interaction with Pavé! Cooperation and communication are key during Festivale. It's advisable for everyone to dump their feathers at the plaza in groups of the same color. Going for the hunt and building up a good supply of feathers first and then trying to get presents is a good strategy.